Just 4 simple, pantry staple ingredients make up this rice side dish that will blow your mind! Kids and adults alike will be begging you to make it again! Yeah, you read that title correctly… stick of butter rice. 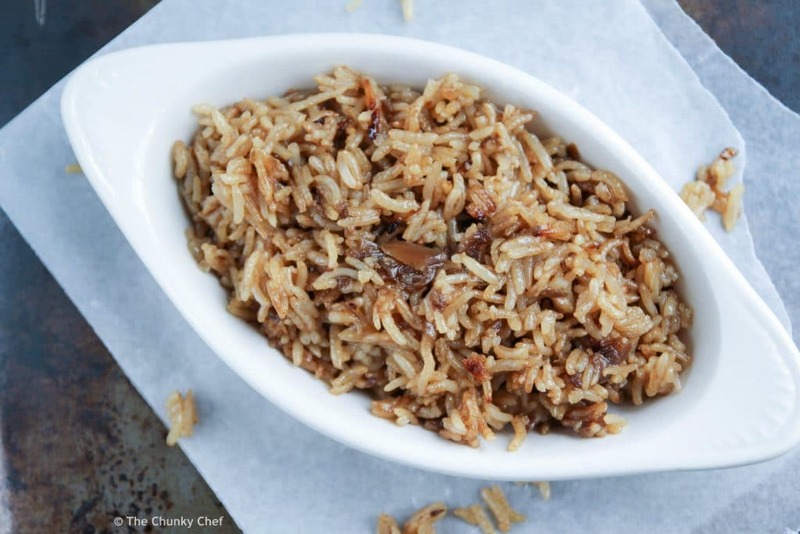 This rice dish is my family’s favorite rice recipe… EVER. And I’m betting that once you try it, it’ll be your favorite too! Guess how many ingredients are in this rice? C’mon guess! Okay, here’s the answer….. 4. 4 ingredients. Hello simple side dish! The other best part about this recipe, is that it’s completely fool-proof and incredibly low maintenance. Even if you say you can’t cook… you can cook this. I guarantee it. My 5 year old has made this before (all I did was the oven part). You may have these ingredients on hand, which makes this recipe even more awesome! Granted… this isn’t a health-food side dish (I mean, c’mon… it’s called stick of butter rice) lol… but honestly, I say go for it. We all need an indulgence, and it’s GOOD. 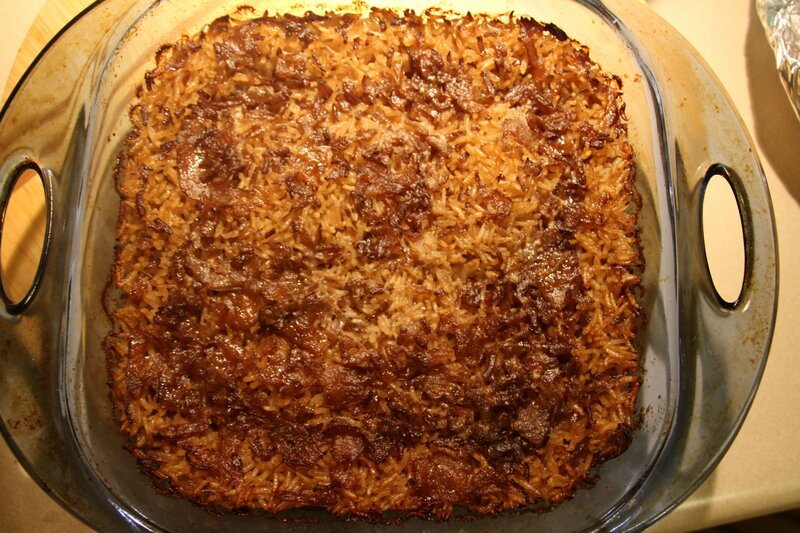 This rice isn’t cooked on the stove top like most rice recipes are… it’s baked in the oven. So no burner is being taken up on your stove and you can slide the pan in the oven and forget about it 🙂 Okay, well maybe not completely forget about it lol. But it bakes for an hour and all you have to do is remove the foil after 30 minutes. Simple right? So here’s the breakdown… long grain white rice, can of beef broth, stick of butter, and a can of condensed french onion soup. That’s it! Just combine the broth, onion soup, and rice. Slice the butter thinly and add to baking dish. Cover with foil and bake at 425 for 30 minutes. Take off foil and bake another 30 minutes. I know, I know… it’s not much to look at. But the taste is INCREDIBLE! This rice would go really well with my Parmesan Crusted Chicken Nuggets, Jack Daniels Glazed Baked Chicken Wings , or Low Carb Baked Chicken Tenders 🙂 A great add-in would be to add a can of sliced mushrooms to the mix… I haven’t tried it yet, because the kids would balk at that lol. 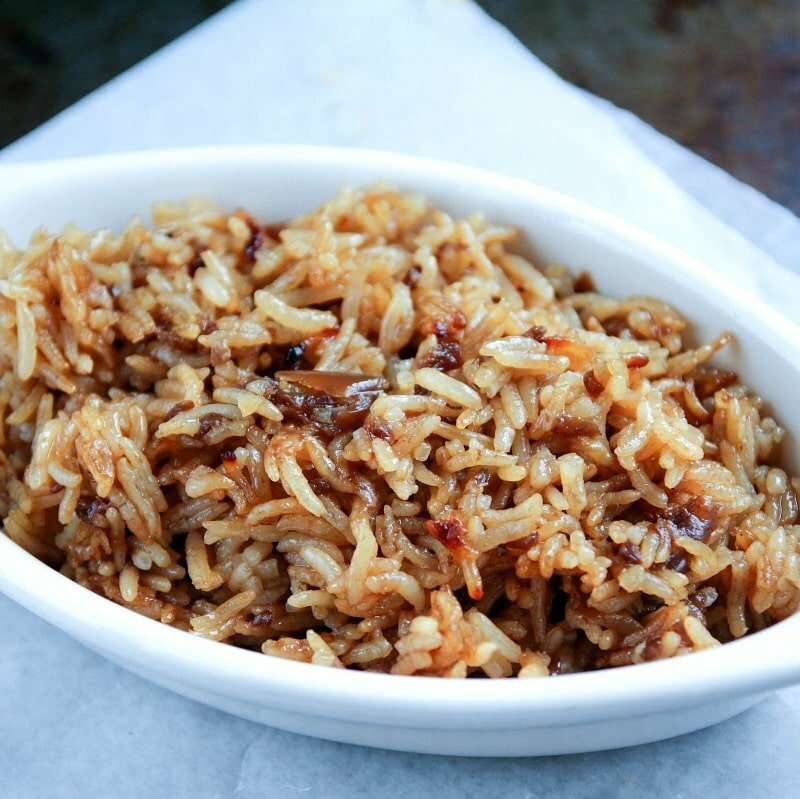 This remarkably simple side dish is the best rice, ever! In an 8x8 inch baking dish combine rice, soup and broth. Cut butter into slices and place on top of the mixture. Remove foil and bake 30 minutes more. My family had made this for years. It’s always a family favorite!!! Has anyone ever made it w/ brown rice instead of white rice? I haven’t tested it myself, but if you do try it, be aware that brown rice takes considerably longer to cook than white rice, so you’ll need to play around with the cook time. How you freeze the leftovers? I spilt some of the juice, how wll it be? I also used extra long grain rice. Depends on how much was spilled… but this recipe is pretty forgiving. I add yellow squash to mine and then top with sliced cheese. Cook for a few mins to melt! 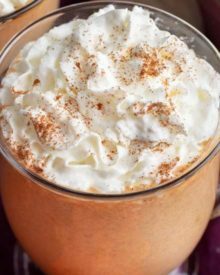 I haven’t tested the recipe other than as written, but you may want to peruse the comments, as other readers may have tried it. i got this recipe from a lady at work. She was warming up leftovers in the microwave and it smelled so yummy I asked for her recipe. Her recipe included a small can of sliced mushrooms untrained. It is now a family favorite and we love mushrooms so make it that way. Would this be a good side dish to serve with chicken Marsala? Would you change it from beef broth to chicken broth? I think that would go great together! I’d leave it with beef, it doesn’t make it taste “beefy”. Reasoning for the NOT instant rice? I assume it’s because it will turn to mush. But that is all I have at home and this sounds wonderful! Yes, it will be overly mushy if you use instant rice. do you add water ? considering soups are condensed? No, you don’t add water for this recipe. How do you double this recipe? Double each ingredient? I don’t want it to be be too greasy? Normally you’d double all the ingredients, but for this particular recipe double everything except the butter and just do about 2/3 cup of butter. I’m going to test this recipe with Progresso French Onion (not condensed) and water in place of beef broth (to make 20 oz of liquid). We have a gluten allergy in the house so Campbell’s isn’t an option. Has anyone tried similar substitutions? Can this be made with olive oil in place of the butter? I haven’t tested it, so I can’t say for certain, but I think that would probably work. I love this rice!!! Can you make it with cauliflower rice?? How would I alter the cook time or recipe?? I haven’t tested this recipe using cauliflower rice, so I really can’t say with any degree of certainty. I’ve made this rice several times. Every time I make it, my family goes crazy for it; even my three year old loves it. So simple and easy and its amazing. Thank-you so much for sharing this recipe. Seriously nummy. Looking forward to making this with grilled steak or chicken. My mom used to make something very similar to this. Thank you for another great recipe. This was so delicious! I’ve made it twice now. The first time I followed the recipe exactly and it came out very good. I made it a second time but this time I only used a third of a stick of butter with parboiled rice, and it was just as good, but less fatty! Great recipe! Thanks for sharing! I always use unsalted since the broth and French onion soup add plenty of salt. 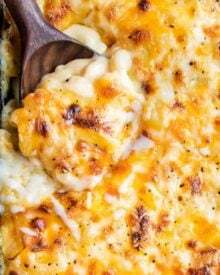 My mom would make this at Thanksgiving and add a jar of sliced mushrooms! I loved it as a kid..
Made this tonight and we loved it! It’s a keeper recipe in my house! I grew up on this rice. We called it brown rice. Now I make it in my rice cooker but 3 or 4 tablespoons is plenty. It turns out great and only takes 20 minutes. 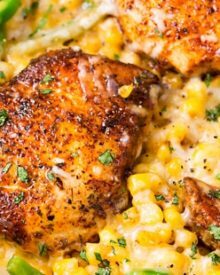 I have added chicken breasts and pork chops at different times ro this recipe and it makes a meal. I cook it just as instructions say and the meat always turns out well done and moist. I have also used left over roast shredded and added at the time of removal of the aluminum foil. We add steamed broccoli and carrots as a side. I haven’t tested it, so I can’t say for certain… but this is a very forgiving dish, so I think it would be okay. I’d reheat it covered with foil so it doesn’t lose moisture. Great idea thanks. Do you happen to know how long I’d have to cook it if I can only go up to 350 to 375° With my oven? You’re welcome 🙂 I’d bake it at 375, but I’m not sure on the time. No, reheating does not work. Actually this rice is perfectly fine reheated Edward. I don’t like rice, but this has changed my mind. I love this! Even the leftovers are great! Where has this recipe been all my life? Thank You! My kids love this too! 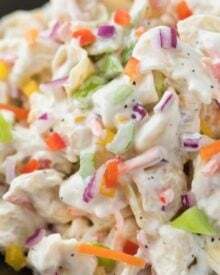 Perfect for quick sides for potlucks and reunions and such. I add a can of mushrooms sometimes. Yum! If you want a full meal take bone in thin pork chops and lay on top gently dunking under juice. Cook 1 hour. I don’t uncover but I may now I have read this. Prob just the last 10 mins. Don’t won’t dry pork.! When my pantry has been bare. I have used an envelope of Lipton’s French onion soup mix with a can of water. Also I use beef consommé instead of broth to make a little richer…. like a stick of butter isn’t enough lol. Can youmake this in a rice cooker? I don’t have a rice cooker, so I’ve never tested it that way. Can I use my le cruset covered pot? I never have foil? Yes, as long as the lid fits snugly. I made this and it turned out sweet. ??????? I have no idea how it turned out sweet… unless your tastebuds are picking up the natural sweetness in the onions in the condensed soup. Love this rice recipe, this is second time I made it and excellent. Nice side to any entree. Can this recipe be doubled or tripled for a large crowd? Hi Judy 🙂 I’ve successfully doubled this recipe in a 9×13″ baking dish, but I’ve never tried tripling this recipe. If doubling though, just test the rice after 1 hour and make sure it’s done cooking. I need to triple the recipe for a large group…would you triple all ingredients or cut back on butter and or any of the liquid? This was amazing! It was so easy to make. I made it in my rice cooker and though it was a little mushy, it tasted fantastic. I could eat the whole thing at once but had to stop myself. I will def make this again, but try it in the oven and compare it with the rice cooker. Thank you so much for sharing. Hi there! So… is it supposed to be stirred in between pull the foil off and finish baking? My top was a little crispy. Once I stirred it, it looked a lot better but still had a little bit of crispy dried out rice. I really enjoyed it! I cut the butter to half a stick and it was great. Will make again for sure! I laughed when I saw your recipe. This was almost a weekly staple in our house when I was growing up. Our version was called mushroom rice. It is a tad different. 1 C long grain white rice, 1 can Campbell’s beef broth or consomme (which ever was in the cupboard), 1 small can sliced mushrooms, 1 stick (1/2 cup) of margarine or butter (Mom used margarine I use butter, but I find the butter makes it a bit greasier so I tend to use a bit less), and 1 tsp of soy sauce. Drain soup and mushroom liquid into casserole dish. Pour in rice, add soy sauce and stir. Melt butter and saute mushrooms on stove in saute pan until they brown slightly. Add to casserole, stir, cover and cook 1 hr at 350°. Mom always cooked it with bone in chicken breasts with the skin on. The skin would crisp up in the oven and it would be perfect. Served with a green salad and garlic bread. A Shelly staple. I make it today. The rice is delicious. And like another commenter said, makes the house smell great. In fact when my mom passed away I made sure I took her covered Pyrex casserole dish, because for some reason the rice cooked better in that than in my stoneware one. This sounds amazing. I had wondered about throwing some dried cranberries and some slivered almonds during the last half hour of baking. May try this soon. I just found this on Pinterest and can’t wait to try it! The thing I like about a recipe like this is that’s a template that can be customized in multiple ways, depending on what you like. My mind is already thinking of different ways to make it. Thanks! I would like to try this for our weekly family dinner, but my grandkids don’t like onions. 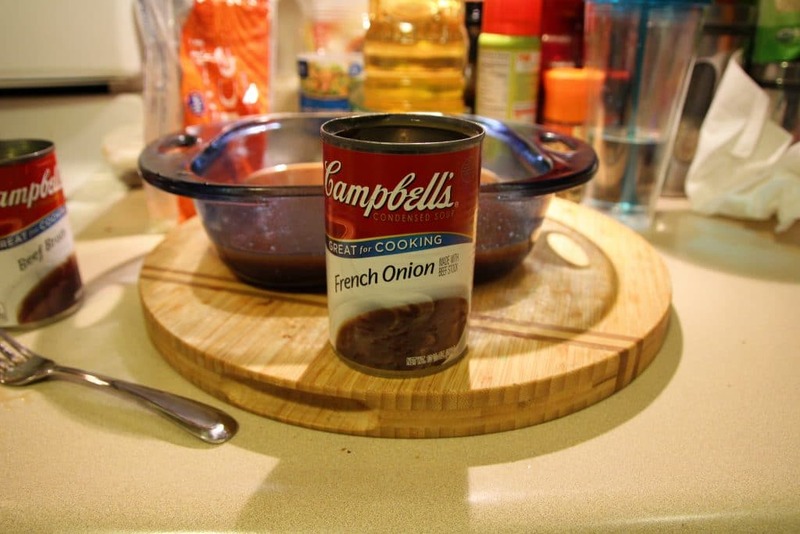 Have you ever tried it with something other than French onion soup? This is an amazing & versatile dish that everyone loves. I’ve made it for many years & it never fails to impress our guests. I usually use beef consommé instead of broth. I do sometimes use a drained can of sliced mushrooms. I made it last week & threw in a handful of sliced almonds. The crunch added a little something special. I love this recipe! 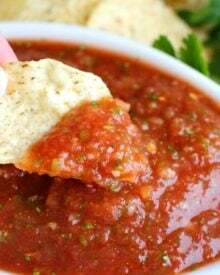 I’m going to try it tonight using salsa and chicken broth! I’ll let you know how it goes!! I just made this tonight, and my kids are not even done eating yet, and they’re already threatening me if I don’t make it again “soon”. I made this tonight but doubled the recipe… except for the butter. I also added pork chops (browned on each side) on top. I covered and cooked at 375 for 50 minutes. I took the cover off and cooked for an additional 15 minutes. Rice was PERFECT and pork chops tender and tasty. Just made this, it’s delish! This is amazing! To make an even easier and complete meal I have added frozen chicken breast or pork tenderloin with some of the butter on top. It is amazingly delicious and easy. Hi Lauren 🙂 I would add about 10-15 minutes to the cook time and check it to see if the rice is tender. Would this be okay warmed up the next day? Hi Tana 🙂 Yes, absolutely! I made this yesterday for a party at my gym and used brown rice. I doubled the recipe and cooked it in a 9×9 deep foil pan and It took 2 hours to cook but everyone RAVED about it. Even had to give out the recipe a few times. Next time I might switch to low sodium broth as it was a tad too much salt for me but I hardly use much salt anyway in cooking. Definitely making it again and maybe adding a protein and veggies for a complete meal. Any thoughts on cooking this in a crock pot? Hi Karen 🙂 I’m not entirely sure, as recipe creation for a slow cooker is way different than as written… but I do know some other readers have had success with a rice cooker. So it might work! I can’t vouch for the result, but if you try it, I’d love to hear how it worked out. Hi! If I needed to double this would I still only use one stick of butter? This sounds like a potluck winner! Ok to double it and use a bigger pan? 1 oz cans? Is that a typo? I want to make a vegetarian version so I bought organic condensed cream of mushroom and vegetable broth. Looking forward to this! 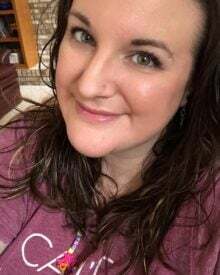 Hi LaShanna 🙂 Oh dear, yes there was a coding error that had those ingredient amounts showing up out of order. I’ve fixed it now, but it’s 10 oz cans 🙂 Hope you love it! I should of read comments first. I used Organic Brown Rice, backed 1-1/2 hours & the rice was still hard. My fault for not using correct rice. Hi Patti 🙂 Brown rice is harder to bake as it just takes forever to cook… glad you enjoyed the taste though. It helps if you follow the recipe. I am SO going to try this! Just to be sure, above says ‘1 cup stick butter’. I am only using 1 stick (1/2 cup) right? Hello 🙂 I’m sure it’s possible, but I can’t give exact instructions because I’ve never used the powders and packets for this recipe. I made this for Thanksgiving and it was a hit!! Hi Claudia 🙂 I’m so happy to hear that everyone loved the rice! Do you think I could add a couple pork chops on top or in the rice before I cook it, and call it a “one pan” meal? Has anyone tried this with Quinoa? Any suggestions on ratios? I am trying this with my own spin on it and I hope it works out. I decided to brown 1 1/2 pounds of ground beef, and double the recipe (we have 7 people in the family) and I’m using a long grain and wild rice mix with it. It smells delicious and I hope it turns out. It turned out great. I’ve made it 3 times since then and it’s a hit every time. 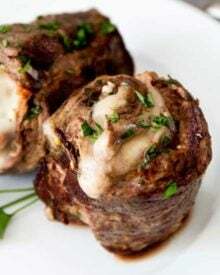 I learned that when doubling the recipe and adding the ground beef, it is best to NOT drain the beef (the fats where all the flavor is) and instead cut back to 1 1/2 sticks of butter and allow the beef fat to be the rest of the fat in the dish, Also when using the wild rice, it DOES take longer to cook. I make it in time for it to cook at least 1 1/2 hours or more depending. It is delicious and makes a full meal. Just add bread and butter and done. Hello! I have the rice pre made bc I was going to try a different rice recipe (only to discover I forgot the main ingredient. ?) Any tips with how to make this dish using already-cooked white rice?? Any ideas for putting a Mexican twist on this?? Add diced green chilies maybe? Tomato soup? Hi Janice 🙂 I’ve never tried it, but maybe a can of rotel? Have you ever tried this with riced cauliflower? I’m doing low carb. Thanks! Hi Michelle 🙂 I’m doing low carb as well… but as of yet, I haven’t tried this with the cauliflower “rice”. I don’t know how well it would work out since the rice is dried and the cauliflower isn’t… so maybe use a little less liquid? If you try it, I’d love to know how it turns out! I was thinking about this also…. I wonder if using the lipton onion soup mix would be a good alternative?? what are your thoughts? Hi Brit 🙂 I’ve never tried it that way, but I think it could work… you’ll just have to add a splash more beef broth to compensate for the dry mix being used. Best of luck! 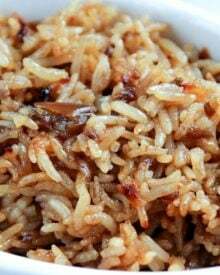 My folks made ‘Favorite Rice’ when we were growing up! 2 cans of beef consomme, 1 cup of rice, and a stick of butter. We still make it! I’m going to try your ‘variation’! What’s not to like about french onion soup? Glad I saw this! My mom made this growing up but she did it with a can of beef consumme and a sliced onion. I guess the end result is the same. LOL. We call it brown rice too and it’s so yummy! Hi. Much too salty for us….maybe specify unsalted butter. Great texture. So, the beef broth is condensed too, right? Just one can of that? I’m glad Wendy asked the question. A standard can of beef broth (over withe the chicken broth and stocks) is 14.5 ounces and *not* condensed. I noticed that the recipe called for a 10 ounce can and noted in the picture that is was the Campbell’s condensed. One will definitely get different results if they don’t use the Campbell’s.. I tried this and it was very good. Family really liked it! I just couldn’t bring myself to put in a whole stick of butter so went with 6 tbsp and added 2 extra tbsp of broth to make up the difference. I make this dish a lot and we really like it. When having a crowd, it goes over well. I usually add a jar of mushrooms to it. I really don’t like to change anyone’s recipe but this is mine.. 2 c rice, 1 stick of butter melted, jar of mushrooms chopped, 2 onion soup, 1 beef broth and 1 consomme. Mix all and bake 1 hr and 10 minutes, at the most, covered at 350* Try this too. You will love it! I would eat the whole bowl. That’s the result with 4 ingredients?! YAAASSSSS! The best looking rice of ever. It sounds so dang good! Holy cow! This looks INCREDIBLE. I’ve never made rice in the oven, but being married to a Louisianan, we eat a LOT of rice. Definitely saving this so I can make it for us to change up our rice game in the near future. I have no idea how we wouldn’t adore this recipe — it’s so simple and sounds utterly delish! I love that this recipe only has four ingredients. And one is my absolute fave, butter! Hellloooooo comfort food! 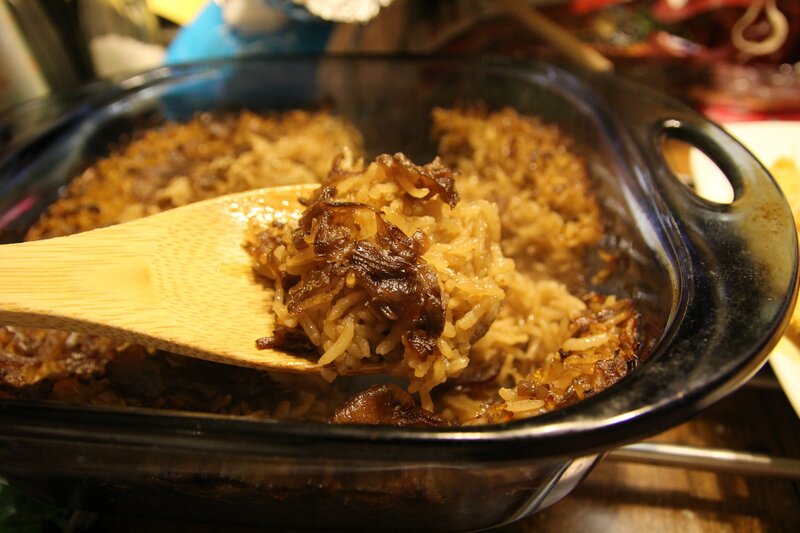 I love the french onion twist on the rice! I tried it with brown rice and made no other adjustments. Didn’t turn out so well. Crunchy rice. I will try it again with white rice since everyone is raving about it. Hi John 🙂 Yes brown rice would definitely need a longer cook time, as in general it takes longer to cook than other types of rice. If you try it again as written, I hope you like it! Could you do this in a rice cooker? I think I’ll try it tonight. Hi Nina 🙂 I don’t have a rice cooker, so I can’t say for certain… but I think it would work. I’d love to know how it turns out! Loved this! My wife hates rice, but since I made it last month, she goes out of her way to pick up the ingredients at the store. Hope she doesn’t burn herself out on it. Tomorrow will be the 5th time we’ve made it in less than 4 weeks. Could this be done in a rice cooker? Just wondering so I could make it and a main dish at the same time, that have to cook at temperatures 100 degrees apart! Hi Desiree! I’m excited you want to make this 🙂 I’ve never made it in a rice cooker (don’t have one 🙁 ), but I think it should work just fine. If you try it, I’d love to know how it turns out! Rice cooker was a success! Super easy and everyone loved it! My husband prefers the rice cooker bc it cooks the grains of rice separately so they don’t become one big wad of mush. Thanks for the recipe! I finally made this the other night. I served it with a chicken dish. OH MY Amanda your Uncle Jim almost ate the whole pan full. I was lucky to get a serving. When it was baking he even yelled from the TV room ” What is that you are cooking it smells AMAZING!” This is one that will be in the rotation. What a delicious dish, we would love it. Thanks so much for sharing with Full Plate Thursday and have a great week. I saw the title and came just to say “you had me at butter” only to realize someone else has already done it!! Still… you had me at that! I love a good rice recipe and this looks and sounds amazing! Pinning this so I will definitely remember to make this! 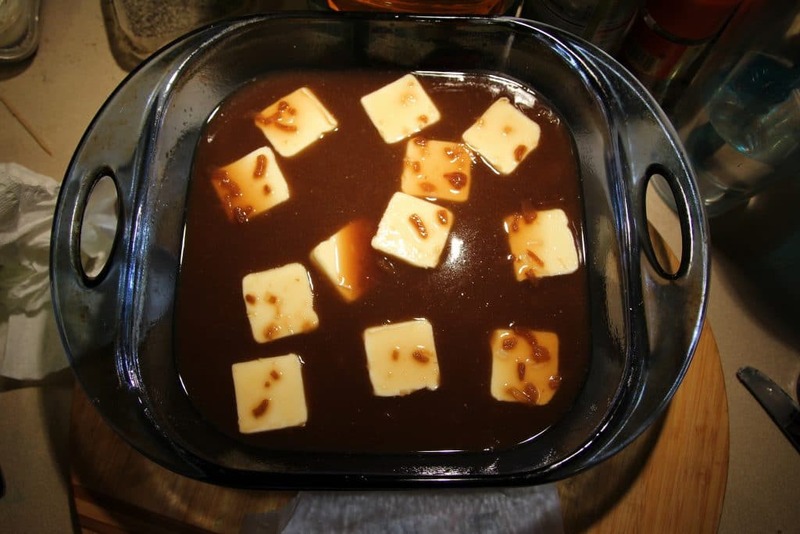 I can’t say no to a stick of butter AND french onion soup. Lol butter seems to be a popular thing 🙂 Me too though… butter makes everything better! Awesome, I hope you LOVE it!! Prep time 2 minutes I’m IN!!! This rice dish sounds YUMMY!!!! Oh yea, I will be pinning this to go with that amazing Asian Beef with Sugar Snap Peas recipe. Yummy dinner for Valentines. My hubby will be singing my praises. You had me at ‘stick of butter’ ! Lol, it definitely makes it tasty! !